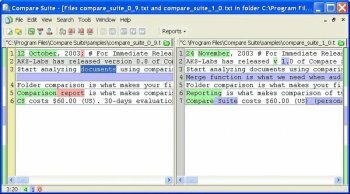 Compare Suite provides file and folder comparison with merge and reporting abilities. File comparison deals with plain text, binary, office documents, such as MS Office files (.doc and .xls), Adobe Acrobat documents (.pdf), Web Pages (.htm). Comparing folders function is useful when you have to compare not a single file, but all files within some folder. If you work with plain text, then you can edit compared documents, apply or decline changes. You can bring comparison details to simple or advanced structured report. Reports can contain some common comparison statistic together with highlighted distinctions in compared files.